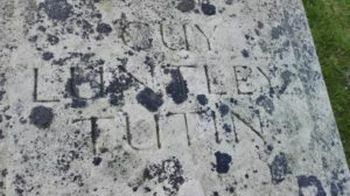 Guy Luntley Tutin was born in Chilwell, Nottinghamshire on 17th November 18942, the eldest of five children of George and Elizabeth Fanny Clara Olivia (née Luntley) Tutin. George, who was born in Nottingham in 1865, had been a prominent amateur footballer as a young man and played regularly for Nottingham Forest in its early amateur game days. Another Beeston residents in that team were Walter and Edwin Luntley, sons of the artist, James Luntley and his wife Elizabeth who had moved from Croydon, Surrey in about 1860, to live at Station Villas, Beeston from where James was soon in demand as a portrait painter by local worthies3. It seems likely that George's football connection led to an introduction to Walter and Edwin's sister Elizabeth and they were married in 1892 and first settled in Chilwell, Notts before moving to live at The Pines, a large house on Broadgate Beeston by about 1895. In 1901, the family, which now included two daughters, was living there, with the assistance of a cook and housemaid as well as a governess for the children4. George was a Liberal in politics and represented Chilwell on the Nottinghamshire County Council for a while. By the time of the war years the family had moved to The Hall, East Leake, Notts but, for a while around 1911, they lived at Devon Lodge, Elm Avenue, Beeston5. After first attending Dunchurch Hall School in Rugby, Guy was sent to Sedbergh School in West Yorkshire in 1908 where he was said to excel, taking part in debates, played cricket and football for his House, became a Prefect and was awarded prizes, notably the Headmaster's Leaving Prize when he left in 1913. During his time at the school, he had also joined the Officers' Training Corps and had reached the rank of Lance Corporal by the time that he left to join his father as an articled clerk in his law firm6. During this frustrating time, he lobbied hard to be reassessed and returned to the Front and, finally, his persistence was rewarded and he returned there in February 1917, rejoining 1st Battalion, by then part of 24th Brigade of 8th Division, on the 23rd, at a time when the battalion was engaged in the German retreat to the Hindenburg Line. 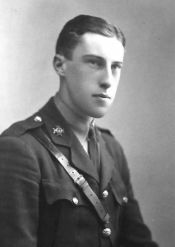 Although his time in active service was again soon interrupted when a sprained knee needed hospital treatment and, in May 1915, shell damage to his hearing and appendicitis necessitated his return to England for treatment, he had been able to demonstrate devotion to duty, gallantry and fine leadership during that short time and had been commended for it. His determination resulted in a further return to the Front which was again cut short when he was gassed and repatriated with bronchial problems. In April 1918, he was again able to return to front-line action with 1st Battalion but exposure to a gas attack again necessitated repatriation for hospital treatment. Remarkably, he was again able to return and was attached to 2/4th Royal Berkshire Regiment when the Armistice came on 11th November 1918 - having served throughout the war and faced gas, injury and sickness but returning continually to make his contribution at the front. But now, with the battalion part of an army of occupation the cumulative effects of these setbacks became too much and, suffering badly from the effects of gas poisoning, he was ordered back to England and admitted to Brook War Hospital in Woolwich, Kent. There, on 27th January, he died. Whilst, the official cause of death was meningitis, it seems likely that the gas exposure and possibly the then current Spanish 'Flu pandemic were also factors. He was buried in the Churchyard at East Leake, Nottinghamshire, where his memorial survives8. Lieutenant Tutin was posthumously awarded the Victory and British Medals and the 1915 Star9. His estate, valued at £369 15s 9d was proved at Nottingham by his father, on 1 August 191910. In addition to his entry of the memorial in Beeston Parish Church, Lieutenant Tutin is remembered on the walls of the Chapel at Sedbergh School and on its memorial website, on the Church War memorial, Memorial Cross and Roll of Honour in East Leake and on the Nottinghamshire Law Society Memorial, originally erected in its library on St Peter's Gate, Nottingham but recently re-located and re-dedicated at Nottingham Crown Court. George and Elizabeth Tutin were to live out their lives in their home at The Hall, East Leake with George continuing to practice as a respected solicitor, eventually with the assistance of his youngest daughter, Barbara Elizabeth Tutin(1901-1961) and his youngest son, Neville Roberts Tutin (1914-1982). Their eldest daughter, Norah Tutin (1896-1962), married Geoffrey Morris Porritt in 1924 and served as Central Organiser of the Women's Voluntary Service for the southern part of Basford Rural District, for 14 years including the critical war years. As such she was responsible for billeting in 18 villages in her area. In 1953 she was awarded the British Empire Medal11. Their second daughter, Margaret Tutin (1898-1977), remained unmarried and continued to live with her parents. It seems likely that both The Hall and Rushcliffe Lodge, the Porritts' home in East Leake, housed groups of evacuees and their teachers during the Second World War12. Elizabeth Tutin died in 1944, followed by her husband George in 1950 and are buried in East Leake churchyard.13. 1The photograph of the inscription on Guy's memorial in East Leake Churchyard, Nottinghamshire is from the Old Sedberghian Great War Roll of Honour website. 2His birth was registered in Shardlow Registration District (of which Chilwell was part) in Q4/1894 (Ref 7b 490). His full birth date is quoted from the Old Sedberghian Great War Roll of Honour website (http://pilgrimage.sedberghschool.org/?s=tutin). 3George Tutin played in nine FA Cup games for Forest. between 1885 and 1890. He and the Luntley brothers were key members of that club in that period (See the Forest Forum website at www.forestforum.co.uk/showthread.php?t=42848&page=18). While playing for Beeston against Mansfield Town in 1891, George Tutin broke his right leg which probably brought his playing career to an end (Nottingham Evening Posr - 18 Feb 1891). He later took up golf and was an early member and one-time captain of Notts. Golf Club and probably Chilwell Manor Club where the Luntley brothers also played. Several Luntley family members are buried in Beeston Cemetery including Edwin, whose memorial can be seen here. 41901 Census - Beeston, Notts: Piece 3153 Folio 5. Guy's siblings were Norah (1896-1982), Margaret (1898-1977), Barbara Elizabeth (1901-1961) and Neville Roberts (1914-1982). 51911 Census - Beeston, Notts: Piece 20428 RD429 SD3 ED3 Sched 130. George was not present, presumably away temporarily, but has not been found elsewhere. 6Details from the Old Sedberghian Great War Roll of Honour website (http://pilgrimage.sedberghschool.org/?s=tutin). 7Details of his military career have been derived from accounts on the Old Sedberghian Great War Roll of Honour website (http://pilgrimage.sedberghschool.org/?s=tutin) and on the Nottinghamshire Law Society's Roll of Honour. Some dates have been derived from or confirmed by entries in the Battalion War Diaries. His promotion to Lieutenant appeared in the London Gazette of 9 July 1915. 8The date and details of his final illness, death and burial are from the Old Sedberghian Great War Roll of Honour website (http://pilgrimage.sedberghschool.org/?s=tutin), the Nottinghamshire Law Society's Roll of Honour and the Commonwealth War Graves Commission website. 9Details from his Medal Card, available on ancestry.com. His original embarkation date (17 May 1915) is also from this source. 10Details of the Administration of his estate are from the Probate Calendar, available at ancestry.com and elsewhere. 11Her award of the BEM and details of her voluntary work were reported in The Nottingham Journal on 1 June 1953. The WVS became the WRVS in 1966. 12This presumption is based on the relatively large number of redacted (probably children) entries on the 1939 Registrations for these two properties and the involvement of Norah Porritt (née Tutin) in billeting of evacuees. 13Other family details are derived from standard genealogical sources.